Few things can do as much damage to your home in as short a time as a serious storm. From hurricanes to tornadoes to more common – but still dangerous – extreme weather events like severe thunderstorms, Mother Nature is certainly not short on ways to trash your private property. Tragically, these sorts of powerful weather events can do damage to irreplaceable things and threaten our sense of safety. But, fortunately, there are many types of storm damage that we can undo in the days, weeks, and months following a severe storm. Not every has an insurance policy that covers extreme weather – though everyone should. If you have insurance and find your space severely damaged after a storm, call the insurance company right away. You want to know as soon as possible what they will and won’t cover and which companies and contractors they will and won’t work with. You’ll also want to make sure that they see the extent of the damage before you begin repairs – you don’t want to pay out of pocket to erase the very evidence that you’d need to be reimbursed! 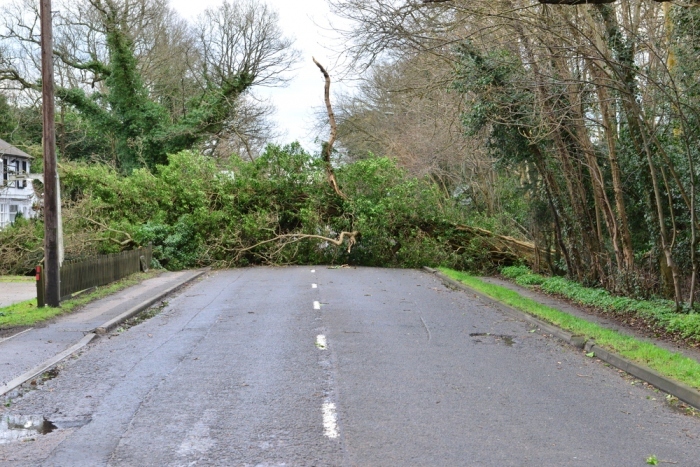 One of the most common problems caused by severe weather is downed trees and branches. Trees are beautiful, but they’re also really big, and this becomes obvious fast when they start dropping on power lines, cars, and roofs. Clearing a fallen tree is no easy task. Cutting it up is only part of the job: grinding down stumps is a job in itself, and all of the wood still needs to be removed from your property when the job is done. Harder still is removing a tree that hasn’t actually fallen yet. Trees can become structurally damaged during storms, and a damaged tree is an accident waiting to happen. A tree that is prone to falling is a liability risk and a danger to your home – and don’t think for a moment that your insurance company will be pleasant if you ignore a dangerous tree until it falls and does damage. For big jobs like the removal of fallen trees and dangerous still-standing trees, you’ll need to call a tree service. These experts are the folks who can safely take down and remove damaged or destroyed trees. Don’t risk doing anything yourself. Your exterior space, of course, is only part of the equation. You’ll want to get started on repairing your home or business itself as soon as possible after a storm. This is true for a few reasons, including the fact that problems with your structure can get worse over time and the fact that your friends and neighbors (or your business’ competitors) may be running to the phone to schedule repairs of their own – and you don’t want to be last in line. Invest in roofing, siding, windows, and other key repairs as soon as possible, and make your space liveable again and your business profitable again. If you had insurance to help you with your post-storm expenses, you’ve surely learned just how important it is to be covered. If you didn’t have insurance, you no doubt learned the same lesson in a less pleasant way. Now is the time to consider what would happen next time. Make sure that you have the proper insurance coverage for your area (double-check regarding flood coverage, which isn’t included in typical homeowner’s insurance policies). Make an evacuation plan and keep your family safe. When it comes to severe weather, you can never be too careful.